Paneer is one of my favs and I simply love it.. Its rich in protein and there are so many dishes you can prepare with it, but if you are in a rush and want something simple and easy to prepare, Paneer Bhurji is the one to go for.. It is a popular and delicious north Indian side dish made from crumbled paneer. 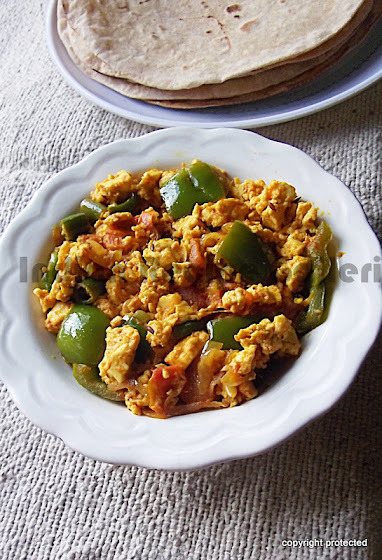 It is really simple and delicious.. Paneer Bhurji goes really well with Roti or bread. If you are looking for some more quick paneer recipes, check out these: Palak paneer, paneer paratha, matar paneer. Finely chop onion, tomato, capsicum and keep aside. Heat oil in a kadai and add cumin seeds. Once they start crackling, add onion and green chillies and fry them till onions turn light brownish. Add tomato and saute well till they become slightly mushy. Now add capsicum and saute till they become half cooked. Add turmeric, red chilli powder, garam masala powder and mix well. The capsicum should not be overcooked or soft. Add the crumbled paneer and mix well. Check for salt and adjust accordingly. Saute for a few minutes and remove from fire. Paneer Bhurji is ready to serve. 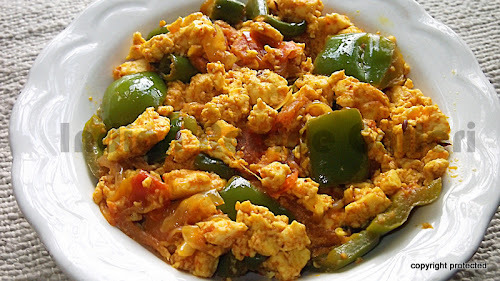 Thanks for giving different types of paneer recipes and paneer bhurji is very delicious recipe and good for health. Here one of the variety taste of paneer dish that is Paneer Biryani recipe and easy to prepare at home. I am prathiba from "The indian food court". Thanx for visiting my blog. You have a wonderful blog with wow recipes. Keep up the good work!!!!!! !